Sage… is how I would describe the wise, warm words of the contributions comprising the recently published anthology Letters for my Little Sister by Cecilia M. Buyswheeler Gunther & The Fellowship “a book of letters written by sixty-eight women about their experiences with Menopause. Yes! The forbidden M word.” You can purchase it in glorious hardcopy via Amazon. There’s another M word: Motherless. There are certain lonely times when you are motherless. No matter the good intentions they’re shoes nigh impossible for someone or something else to fill… when I recently married although we eloped with no guests, wanting some accompanying presence I wore my mother’s watch, her mother’s brooch and donned a wedding ring made from both their bands. People mean well. In my mid 30’s, my father’s youngest and only sister (whose own mother – my beloved Nanna – died more than a quarter century before) having entered that stage in her life handed on to me with only the words “you might need this” an unprepossessing Coping with Menopause booklet. Several years later with polite thanks to my aunt I returned it unopened. We first heard of Letters for my Little Sister when Celi aka Miss C of The Kitchens Garden (who is Cecilia M. Buyswheeler Gunther) wrote “my mother died when I was a young Mum…” and about “Change of Life. The Big Secret. The Witching time. The aging. The Menopause” asked of The Fellowship “But what am I to tell my little sister? What shall I tell her? How shall I draw the pathway that she will follow. I am the oldest. I want to write a letter for my sisters…“. It seems many of The Fellowship are similarly motherless but not necessarily. However, it’s this that made a difference to me; a group I felt I belonged and could make a contribution to. Sage… as in the plant that has “one of the longest histories of use of any culinary or medicinal herb”, on that same subject; menopause, is what I’ve had success using to halt hot flashes which began not long after I sent to Celi my own Letters for my Little Sister essay about my journey through peri-menopause. After reviewing the plethora of remedies offered both online and in pharmacy, being astonished at the cost of proprietary products & the multiplicity of natural remedies, sage struck me as easy and available. Not having regular access to garden and sage plant to make a fresh infusion I thought I would begin the trial simply & cheaply, so purchased from the supermarket for a couple of dollars a packet of dried sage as you would use for cooking. There are contraindications and precautions to the use of sage which I heeded, proceeding cautiously. For my morning cups of tea several times a week I steep a pinch of the dried herb with boiled water in a small teapot, drink half and refill. Within a month the hot flashes disappeared and haven’t returned. The writer is conveying information from her own experience and is not a health care professional. The information contained in this topic is not intended nor implied to be a substitute for professional medical advice, it is provided for informational purposes only. You assume full responsibility for how you choose to use this information. Always seek the advice of a health care professional before starting any new treatment or discontinuing an existing treatment. Talk with a health care professional about any questions you may have regarding a medical condition. 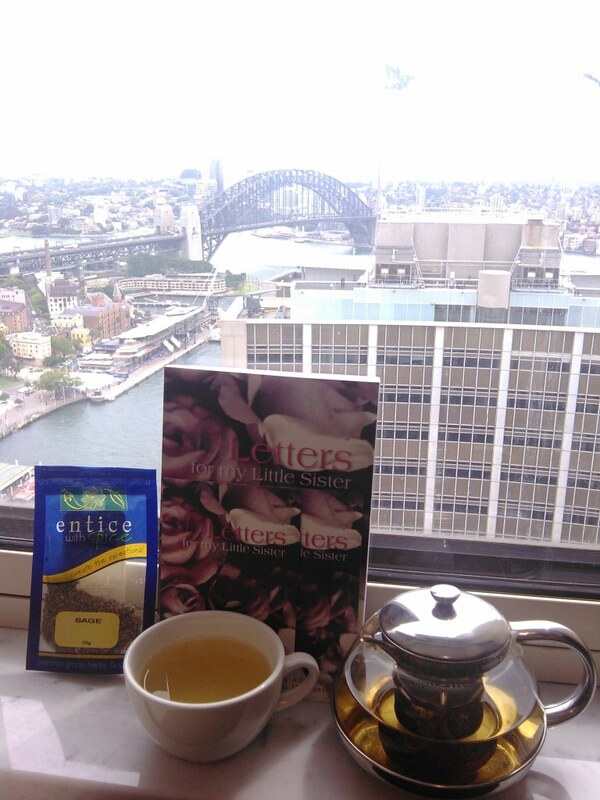 This entry was posted in Blog and tagged Australia, book review, Letters for my Little Sister, menopause, motherless, Sage.